Heat oven to 400°F. Lightly crush five 36x12-inch sheets of foil into 5 (4-inch) balls. Flatten tops of balls slightly; place flat sides up on ungreased cookie sheet. Or, place 5 (10-oz) custard cups upside down on cookie sheet; spray outsides of cups with cooking spray. Spread sesame seed in pie pan. Separate dough into 5 biscuits. Press or roll each biscuit into 6-inch round. Place each round in sesame seed in pan; press firmly to coat one side with seed. Place each round, seed on outside, over foil ball on cookie sheet, shaping dough gently to fit around foil and form bowl shape. Dough should not touch cookie sheet. Bake 15 to 20 minutes or until golden brown. Place foil balls with bread bowls on cooling rack; cool 5 minutes. Remove bread bowls from foil balls; discard foil balls. Meanwhile, in 3- or 4-quart saucepan, heat soup. 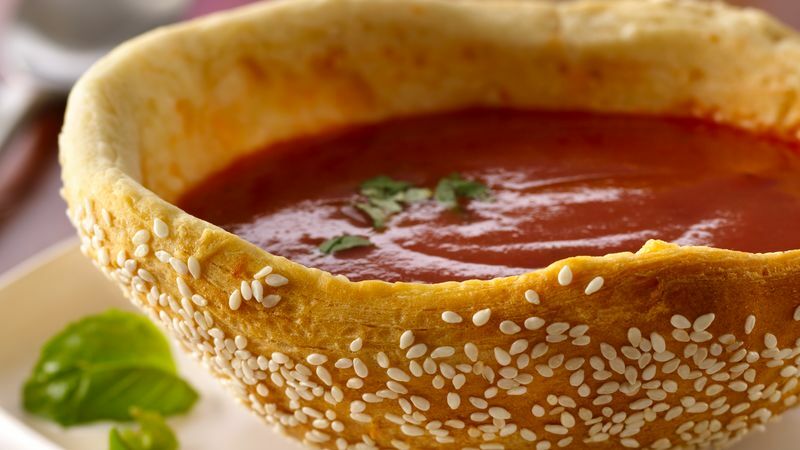 Place bread bowls in shallow soup bowls or pasta plates. Ladle soup into bread bowls. If desired, top with shredded Parmesan or Cheddar cheese.